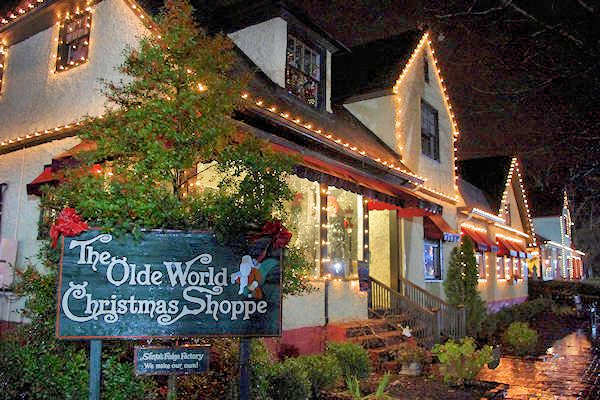 Get in the holiday spirit by visiting one of these "Norman Rockwell" small towns near Asheville in the North Carolina mountains! 1. Forest City (pic at top): Our top pick for Christmas towns decks out Main Street with a million lights! The lighting ceremony is Thanksgiving night (just like those Hallmark movies!). Ride horse-drawn carriages down the street on Saturday nights and hayrides on Friday night. Come for lunch and step back in time with hand patted hamburgers, cherry Cokes and milkshakes at the old-fashion soda fountain at Smith's Drugs. Plus, see an impressive classic car collection. Read more about their Hometown Holidays. 2. Bryson City: From the depot, hop aboard the Polar Express train for the "North Pole" on the Great Smoky Mountains Railroad. Before your trip, browse galleries, shops and find a variety of restaurants and a brewery. Don't miss the Chocolate Shoppe! Watch the Appalachian Toymaker create handcrafted wooden toys paired with storytelling. 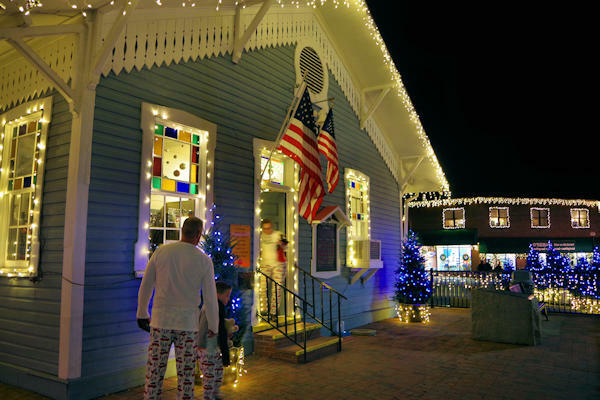 Iconic small town America events include their big parade, nights of caroling, letters to Santa, art festivals and cookie walk. Go to their Website for holiday happenings. 3. Hendersonville: With the second largest downtown (after Asheville) in the mountains, there are plenty of local stores to explore, including Mast General Store, and 24 local restaurants. Their Home for the Holidays includes many events throughout the season, including ice skating and wagon rides. 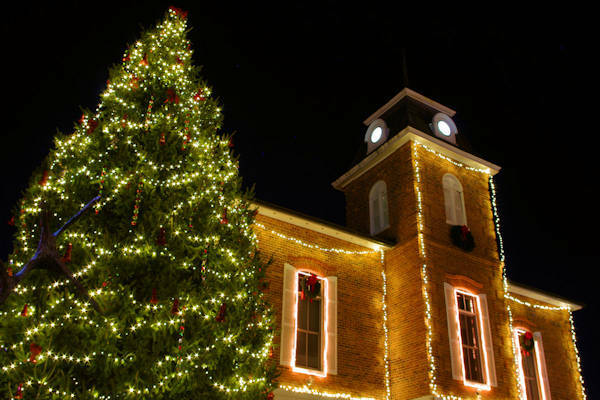 Join the locals for the festive tree lighting on the Friday evening after Thanksgiving. Enjoy plenty of holiday concerts and professional theatre at Flat Rock Playhouse. Read more about their Home for the Holidays. 4. Dillsboro: This tiny artist village near Sylva is big on art! Browse many studios and galleries, including the Dogwood Crafters Artisans Cooperative Gallery with 80 artists. 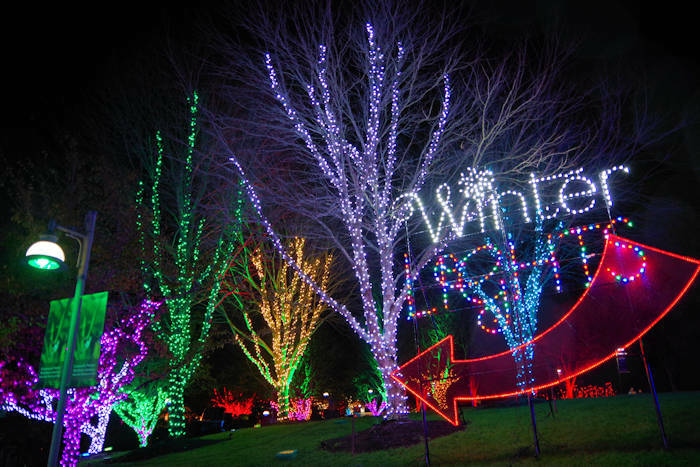 Don't miss their Festival of Lights and Luminaries during the first two weekends of December. Read more. 5. Beech Mountain and Banner Elk: These two villages high in the mountains are just a few miles apart. 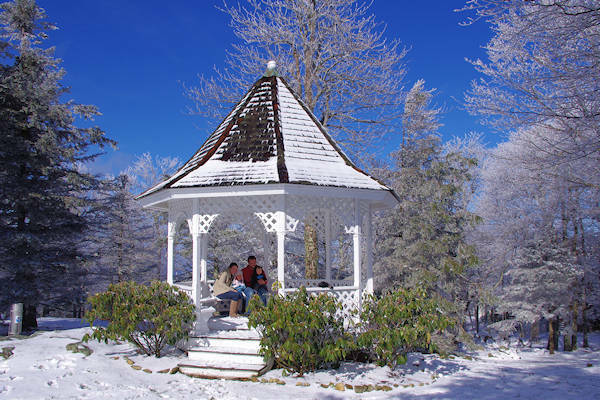 The best chance of a white Christmas is Beech Mountain, the snowiest town in North Carolina. In fact, it's the highest town in eastern America. If mother nature doesn't cooperate with providing snow, the ski resort is a sure bet for a host of winter activities, including tubing and ice skating. Read more. Nearby is Top Ski Town Banner Elk with Christmas tree farms to choose and cut your perfect tree. 6. 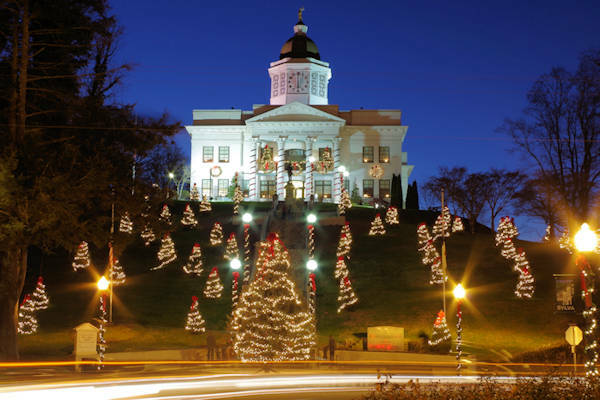 Sylva: The most photographed courthouse in North Carolina sits atop a hill of Christmas Trees, overlooking Main Street filled with many places to explore, shop and dine. Sample seasonal beers at Innovation Brewing. 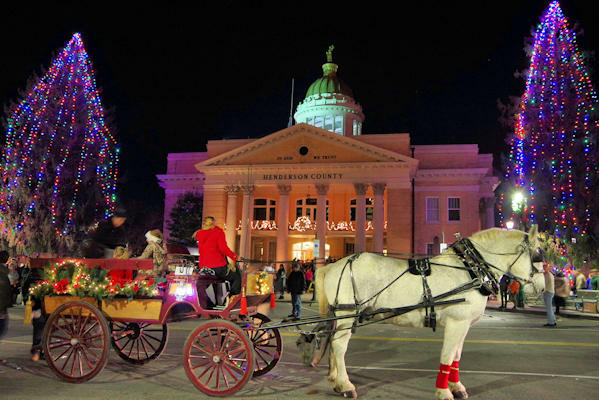 Their "Christmas in Sylva" weekend is November 30-December 2 with tree lighting and downtown concert Friday night at 7 PM, Winter Market and luminaries on Saturday and Christmas Parade on Sunday at 2 PM. Read more. 7. 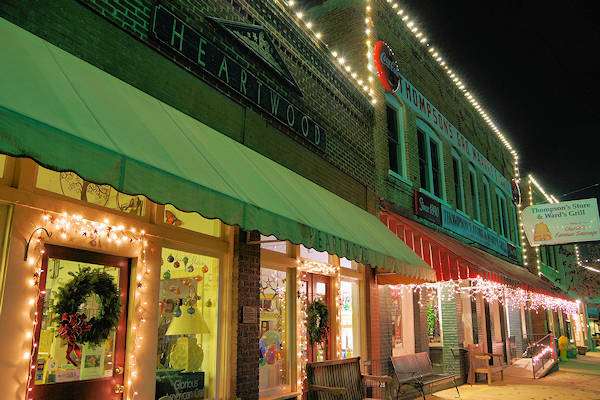 Saluda: This adorable, tiny town (population 700) is big on great shopping with 100-year old general stores and galleries like Heartwood that has been there for 30+ years. Find some fantastic restaurants too. The extra festive Hometown Christmas is December 14, 2018, 6-8 PM. Read more. 8. 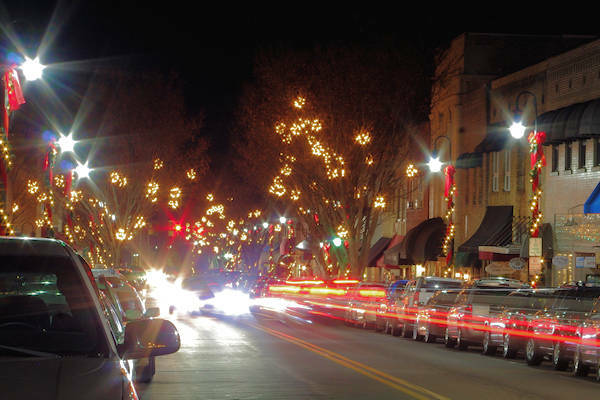 Waynesville: Lighted balls line picturesque Main Street, filled with great local shops and restaurants. The first weekend of December brings Holly Days, kicking off with Art After Dark on Friday evening at the many galleries and ending with the parade on Monday night. 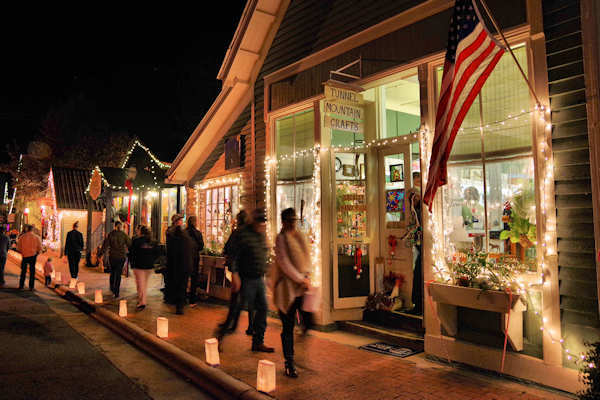 The second Saturday night of December is A Night Before Christmas, an old-fashioned celebration with caroling, wagon rides, Bethlehem market place and luminaries. Read more. 9. 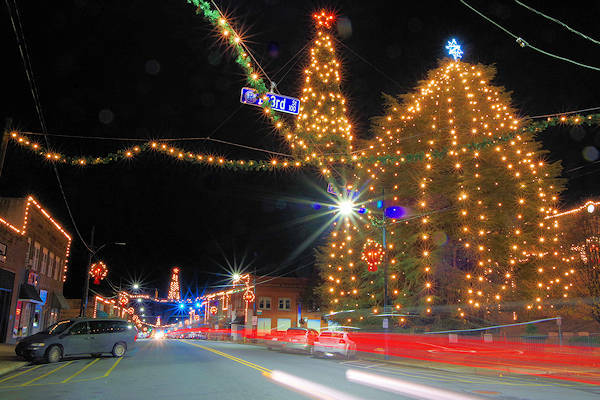 Rutherfordton: See North Carolina's largest living Christmas tree by the historic Courthouse, towering 75 feet and dwarfing the buildings along Main Street. Their Historic Small Town Christmas Celebration (first Saturday in December, 1-7 PM) includes sidewalk vendors, parade at 5 PM, tree lighting, music and more. During the day, visit nearby wineries in the Tryon Foothills Wine Country. 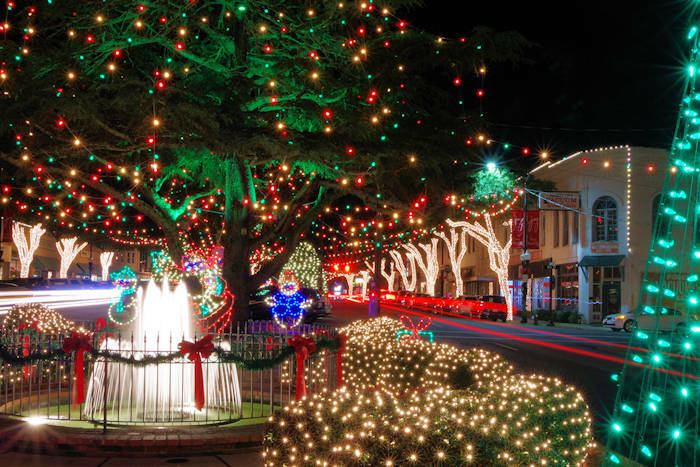 Our top Christmas town Forest City is just six miles away, so you can visit both! Read about more things to do. 10. Brevard: With the stately courthouse on the town square with the towering Christmas Tree, this town is home to many great local stores including the longtime favorite O.P. Taylor toy store. Down the street is the quirky Aluminum Christmas Tree Museum. The Holiday Twilight Tour is the first Saturday of December, 4-8 PM, after the 3 PM parade. Read more and register to win a Holiday Getaway! 11. Biltmore Village: While this is not a separate town since it's in the city of Asheville, this village was built by George Vanderbilt at the entrance to his Biltmore Estate. 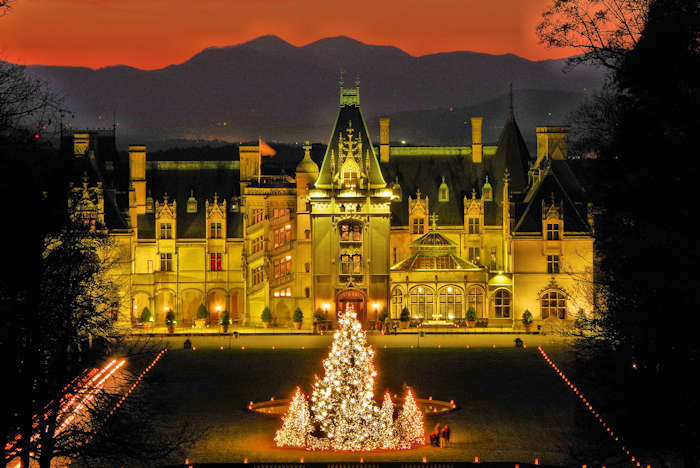 Many visitors to Christmas at Biltmore miss the charming streets filled with historic buildings and houses filled with shops, galleries, restaurants and breweries. On the first weekend in December, Dickens in the Village brings carriage rides, roasting chestnuts and costumed dancers and musicians. Read more. 12. 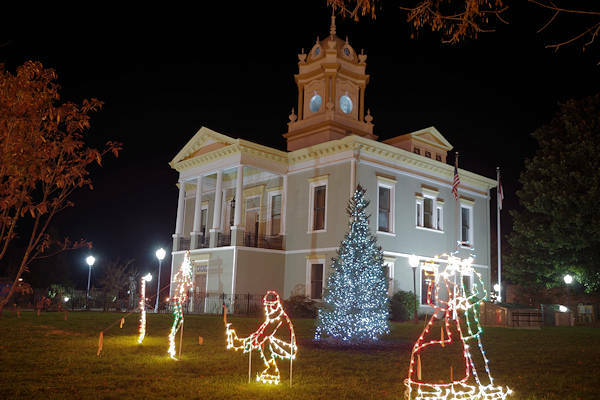 Morganton: Enjoy the lights around the courthouse. Browse many local shops or the Holiday Farmers Market and try some local brews at the lively Catawba Brewing or Fonta Flora. Check out the impressive line-up of concerts and performances at the City of Morganton Municipal Auditorium (CoMMA). Parade is the first Tuesday night of December, 6 PM. 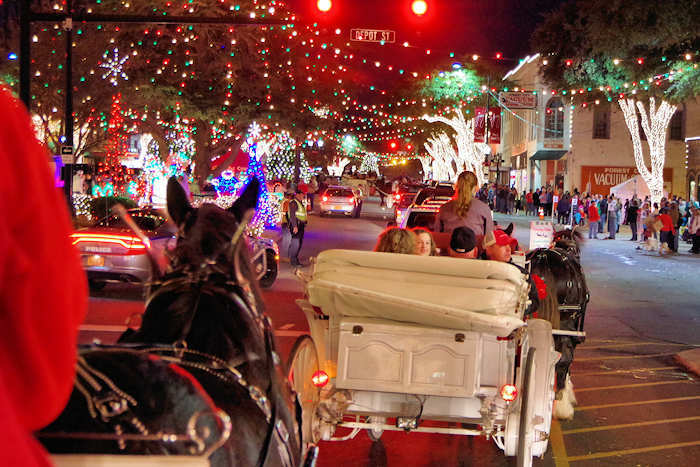 Carriage rides on Friday and Saturdays from the weekend before Thanksgiving through the weekend before Christmas. Read more.